So how exactly did Dublin start hosting the auto show? In 1982 Bob Lincoln, the president of the Central Ohio Chapter of the Arthritis Foundation, and Leonard Immke, the owner of Immke Buick, shared a vision. 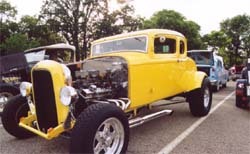 They wanted to create an annual "classic" car show that would take place in Central Ohio to serve two purposes. The event would raise much-needed funds for the Central Ohio Chapter of the Arthritis Foundation. That first year, Leonard made a few telephone calls and raised $50,000 while the show was held in the Immke lot. The first show was a small one-day event, but it was very successful and planning for the next year began. The show was then moved to a new home at Metro Place in Dublin, where it has continued to grow. The Cruise-In now boasts over 1,500 cars that come from more than 20 states to compete for many prestigious awards. The Metro Place in Dublinis a business park that has a loop shape. There are several Dublin hotels within this loop so those traveling for the show can stay right in the midst of the events. There are also plenty of free parking lots and grassy areas. Dublin’s free parking and spacious, suburban grounds make it a great place to host car shows. The Cadillac & LaSalle Club will be holding their National Meet at the Marriott Northwest on Blazer Parkway in Dublin August 10-13, 2011. For each day, General Admission is $10 per person, children 12 and under are free. To purchase general admission tickets in advance, click here, print receipt and bring it with you to the event as your admission.